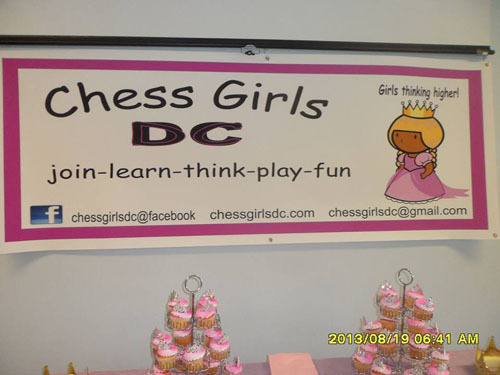 If you stop by the B-Café for a bite to eat on Saturdays around three in the afternoon, you will see a trail of young girls making their way to Chess Girls DC, a nonprofit founded by Robin Ramson to get more girls interested in the game. Her daughter Sarah, age 4, has been playing for more than a year. Ramson sought to create a community for her daughter, while also increasing the participation of girls in STEM-related endeavors such as science, technology, engineering, and mathematics. In an intellectual sport usually male-dominated, Chess Girls DC brings out all things frilly. From the pink chess boards and chess pieces to the tiaras and doll babies, Chess Girls DC clearly communicates that this program belongs uniquely to the girls. Girls playing during an interview by local FOX TV affiliate. 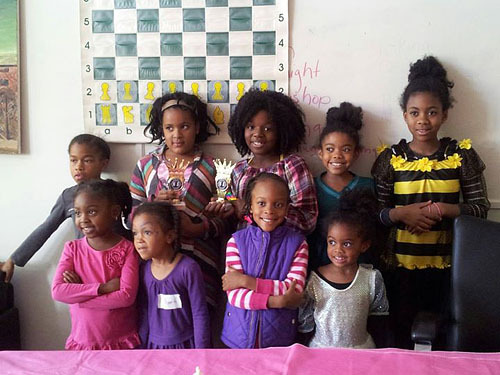 Chess Girls DC started out at Woodridge Library in the spring of 2013. At that time girls were less than 5 percent of the participants in the free chess programs offered through the library. Ramson approached the public library to partner with the chess instructor to designate a special hour for girls. Chess Girls DC transformed the atmosphere of the room with splashes of color, colorful chess equipment, and refreshments. Girls’ attendance skyrocketed. After the transformation the gender ratio in class rose to 50-50. 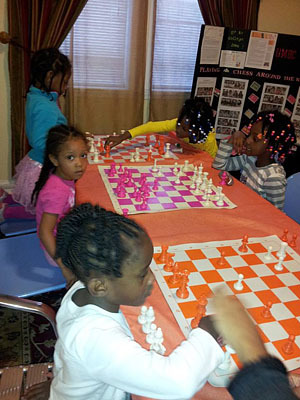 Chess Girls DC was asked to continue the program during the summer of 2013 and through the winter months. Surprisingly, attendance for girls remained higher than normal during the winter, when attendance drops off for most programming because of the weather. Closing of the Woodridge Library for renovation led the program to move to space next door to the B-Café. Though the aim is fun and to generate interest in chess, the larger goal is to improve STEM outcomes for girls. According to a 2012 study from the Department of Education, in 2009-10 females made up less than 25 percent of participants in science, technology, engineering, and math programs. Ramson says Chess Girls DC serves to create a support system for girls K-12 by using chess as a tool to improve STEM learning. “Understanding spatial relationships between pieces is critical for winning at chess. Spatial visualization is a factor that is important to thinking in many disciplines of science, engineering, technology, mathematics, medicine, and geology to name a few,” says Ramson. 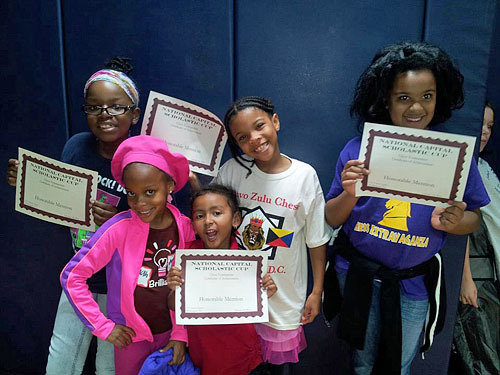 Chess Girls DC hopes to include chess tutors for girls who want to compete at the scholastic level. Long-term goals include creating scholarships for high school girls who want to apply to colleges with strong chess teams. 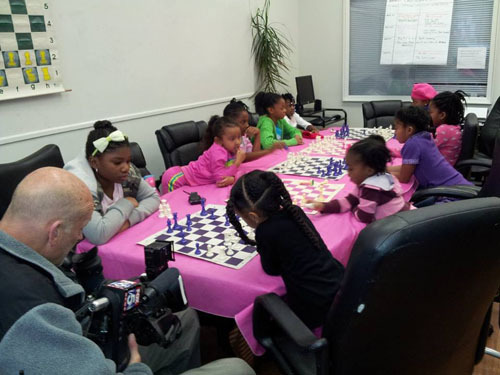 Ramson keeps things lively at Chess Girls DC with field trips and special guests. Participants recently visited the Martin Luther King Jr. Library to learn about 3-D printers. There they also explored spatial relationships through an old-fashioned game of double-dutch. Master jump-ropers from DC Retro Jumpers demonstrated how spatial awareness translates into maneuvering between two ropes in order to jump, double-dutch style. Monica Z. Utsey, a freelance writer and editor, is president of the Southern DC Chapter of Mocha Moms Inc. and co-founder of the Sankofa Homeschool Community. Videos by DC Girls Chess. I am writing to ask if you would please remove the photograph that I am in from the above newsbrief, “DC Girls Chess…Queens Rule!”. The information that has been submitted is not factual and is misleading, regarding the Woodridge Library. The chess program at the Woodridge Library is a program that I have run for almost ten years. I seek no celebrity, but the truth is that Mrs. Ramson, Muhammad and Utsey regularly brought their children to my free classes and free tournaments, at the libraries where I run chess programs, for several years. The picture that I am in is from a free tournament that I gave at the Woodridge Library, not Mrs. Ramson’s organization. In addition, regarding the photo that I am in, Mrs. Ramson did not get permission from the parents to use the children’s images, nor did I give her permission to use my image. Please feel free to email me at Vaughn_Bennett@yahoo.com if you have any questions. I accept responsibility for putting those photos on the article. These were photos from the Facebook page of Chess Girls DC and there were no captions, so it is difficult to know the details. I could have added captions with the appropriate names if they were available. We all are trying to advance the cause of chess. Thank you for responding so promptly Daaim. I have spoken with Robin Ramson and she has informed me that you have been helpful to their initiative and your disappointment came as a surprise. Be that as it may, we are all trying to see our children develop and chess is a perfect way to do this. We have to work together to achieve this goal. Our youth are being lost (gone wayward or killed) while we remain divided on minor issues. Greetings everyone. From what I can see on this site there are no pictures that involve Vaughn Bennett. The pictures were taken at our club and involve our club members and we have full permission from the parents at our club to post on our facebook page especially during tournaments. Any pictures that were used from the public library are public and the library has expressed permission to use them and they would have been downloaded from a public site. In my opinion there are no apologies that need to be made. The parents who participated in the Fox 5 interview watched and by action gave full permission to use their children images. I removed the picture that Vaughn was referring to. It was a very nice picture of the girls receiving awards at one of his events. I found it on Facebook. I take responsibility for posting it without his permission. Thank you for identifying the weakness in our community. It is a shame that some of us are still unable to focus on the needs of the community and the success of our youth. Vaughn has always been a friend to our household and a benefit to our daughter as well as other youth throughout the community. I am surprised at his position about a picture and even the minor origin of Robin’s Chess Girls program. I hope he uses these comments to focus on the overall need in our community and participation of 1000 more “Robins”, Girls, their Brothers and their parents. Vaughn is still welcome to participate! We love and appreciate Vaughn and all that he does! I am the parent of Ayinde Utsey who was indeed one of Mr. Vaughn’s students at the Woodridge Library. We are very grateful to Mr. Vaughn for his instruction to the young ones who learned a great deal from him. In fact, Ayinde is now participating in tournaments and winning! So he thanks to Mr. Vaughn, Ayinde is off to a great start. 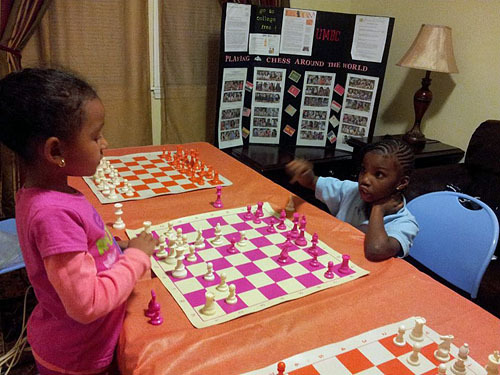 However, Chess Girls DC bears no resemblance to the free program that my son participated in at Woodridge Library. Chess Girls DC was a completely different program for girls only. To my knowledge, the free program at the Woodridge library was open to both boys and girls. Chess Girls DC, on the other hand, was founded to attract more girls to the game. I applaud Mrs. Ramson for her hard work and dedication to bringing more girls of color in the game of chess. As far as I know, there are no programs for boys-only, but the gender disparities in chess are immense. Boys tend to take an interest in “gaming” at a much higher rate than girls and they tend to stick with it. There are a lot of reasons offered for this. There is also a lot of debate on how girls can be encouraged to play more, but girls do embrace the game early on. The real issue is convincing them to stick with it into their teens and past high school. Most do not and the drop-off is precipitous. I would urge Chess Girls DC to get in touch with USCF. Programs dedicated to girls taking up chess at earlier ages align well with the organizational vision of USCF President, Ruth Haring, and USCF Executive Director, Jean Hoffman. There may be some national resources and publicity available. 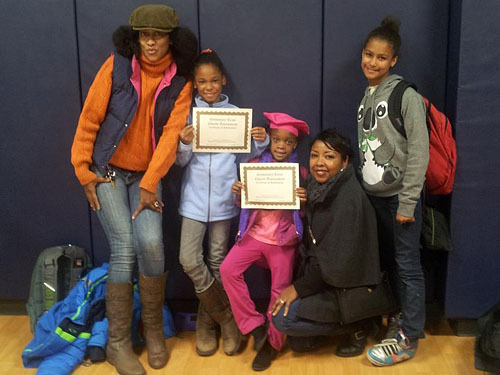 Chess Girls DC will host it’s first unrated community tournament for Girls K-12. The tournament will be held December 19, 2015. Registration starts at 12:30, First round starts at 1pm. You will be able to register on line December 1, 2015. The cost is $5.00. Trophies will be awarded. You do not need to live in DC to participate. United States Chess Federation rules will be observed. Email: chessgirlsdc@gmail.com for details. Chessboards will be provided. You may bring your clock. Special prizes will be awarded for notation. Congratulations to the organizers and participants. Hopefully, things will grow from strength to strength. Well its a good start but ULTRAMODERNISM is growing as the No.1 Chess Practice in Traditional Events here in the U.S. as a matter of fact Michael Mcduffie got some of the young heads LEARNIN some UM basics now in downtown Buffalo N.Y. so its just a matter of time now , doesnt matter if ur in D.C. or St. Louie, or a Newyorker, its all the same but good some work being done gotta start somewhere.